A system for building, managing, deploying, and executing autonomous decision making processes on a corporate scale. Includes the ability to capture and analyze process outputs and meta data. The Workbench supports evaluation of alternative decision making policies against multiple external scenarios. 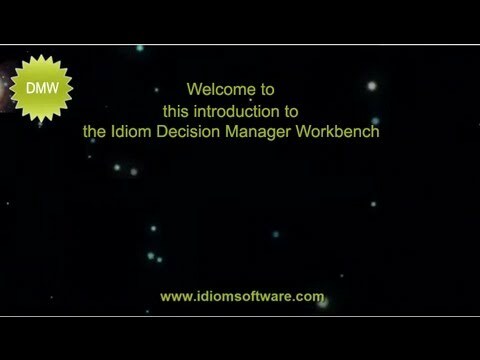 The IDIOM Decision Manager Workbench [DMW] was originally sponsored by a large corporate customer to manage extensive libraries of decision-making processes. Complete decision models, mappings, and other coded artefacts are uploaded into the DMW platform, where they can be collated into multi-step decision making processes. DMW provides for extensive testing and life cycle progression of the processes and the assets that they contain, with clear separation of responsibilities between the development and production worlds. DMW includes a separately installable Windows Service that will self-register with DMW. The DMW scheduler will then trigger the Service to load processes according to operator defined schedules. The processes are loaded directly from the DMW database, including all executables and runtime parameters. Assuming that the process contains mappings or other autonomous data access capability, the process then operates autonomously against enterprise data sources. Any number of Services can be operating simultaneously to provide a grid like capability for really large scale processing limited only by the ability of the database to supply the data. The DMW Service logs meta data of all process activity back to the DMW's internal database, including decision model generated alerts and supporting context information that can used for audit or management purposes.